Conveniently located in the quiet picturesque streets of Sandy Bay, which is one of Hobart's most exclusive suburbs, lies this quality self contained accommodation. 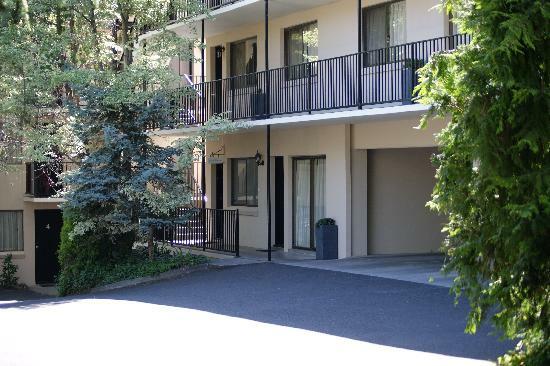 Grosvenor Court Apartments offers spacious studio and 2 bedroom apartments, perfect for individual travellers, couples and families travelling to Hobart. Nearby Attractions : Short walk to Wrest Point Casino, Hobart Royal Yacht Club, Salamanca Market, University of Tasmania, Hobart's best restaurants and Hobart's spectacular water front and the Hobart CBD is a 3-5 minute drive away. 2 Bedroom Standard Apartment : Sleeps up to 6 guests on 1 Queen & 4 Single Beds. 2 Bedroom Standard Apt : Sleeps up to 6 guests on 1 Queen & 4 Single Beds. 2 Bedroom Superior Apartment : Sleeps up to 5 guests on 2 Queen & 1 Single Beds. 3 Bedroom Cottage : Sleeps up to 8 guests on 2 Queen & 4 Single Beds. Queen Studio Apartment : Sleeps up to 3 guests on 1 Queen Bed. Studio Apartment : Sleeps up to 3 guests on 1 Queen Bed.